In transit and in the air, ELFA Leather upholstery for the entire passenger journey ELFA Leather will be exhibiting again this year at the Aircraft Interiors Exhibition in Hamburg and on stand 6B38 in Hall 6 you can experience gate seating and upholstery panel designs that reflect the latest trends. The multi-award winning material provides the texture, look and styling flexibility to give an outstanding passenger experience. Throughout the entire passenger journey- from home to the final destination- the seat dominates the travel experience. Expectations are high and passengers now demand the same high standard of seat comfort and hygiene regardless of mode of transport. A typical trip may take many hours and include car, coach or rail, airport shuttle, transit seating, lounge and departure gates areas all prior to the main in-flight experience. 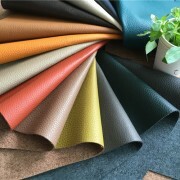 Many of the top airlines choose ELFA Leather and applications are likely to include Economy, Business Class and First Class upholstery together with cladding on monuments and bulkheads. Already an established favourite with bus and coach operators, ELFA Leather is increasingly being used to extend an airline’s brand to dedicated lounge and departure gate seating. The durability and easy maintenance of ELFA Leather provides real benefits here too and helps to keep a consistent level of appearance and comfort throughout the entire passenger journey.